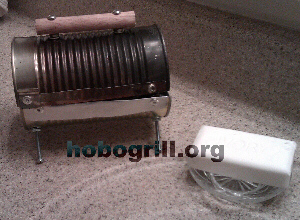 Hobogrill®.org, mini charcoal grills made from recycled materials. 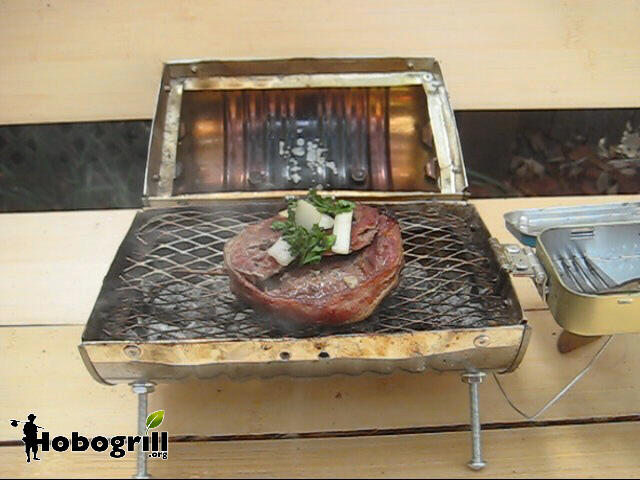 Hobogrill® grills are lightweight, portable, wearable, efficient, ecofriendly and effective. Cook chicken, fish, steaks, burgers, shrimp, lobster, sausages, hotdogs, popcorn, bacon, eggs, potatos -- anything to perfection! Among the Hobogrill® product line is a collection of small, portable, charcoal and multifuel cooking apparatuses such as one that might be used by a hobo. Now you too can enjoy the same luxuries that hobos have been having which is a hot meal, anytime, anyplace. 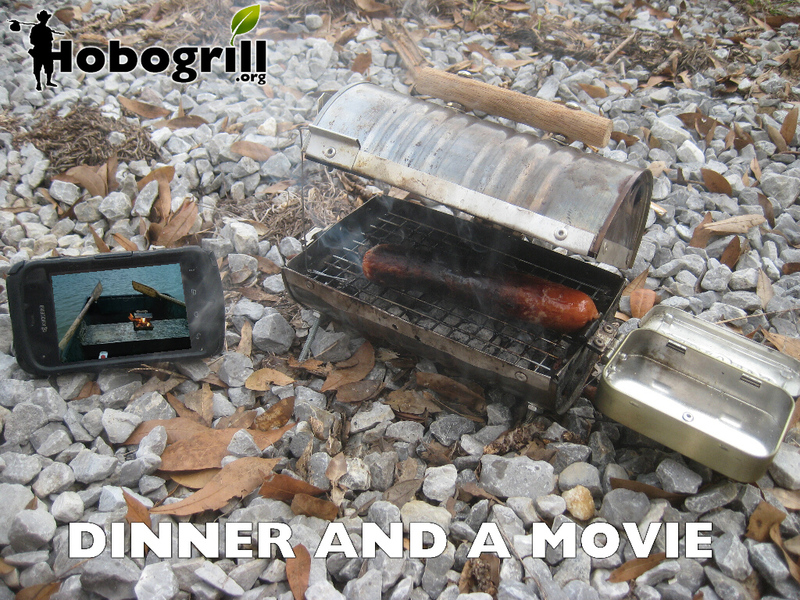 Hobogrill® grills are compact enough to be washed in a kitchen sink with soap and water. Even if you are using electricity at home to cook your food, you may indirectly be using coal if that's what your local power company uses to generate the electricity. Additionally, since the grill can actually cook your food using just 1 coal (2 is optimal for thicker pieces of food) you will have reduced your energy costs for cooking to their empirical minimums. 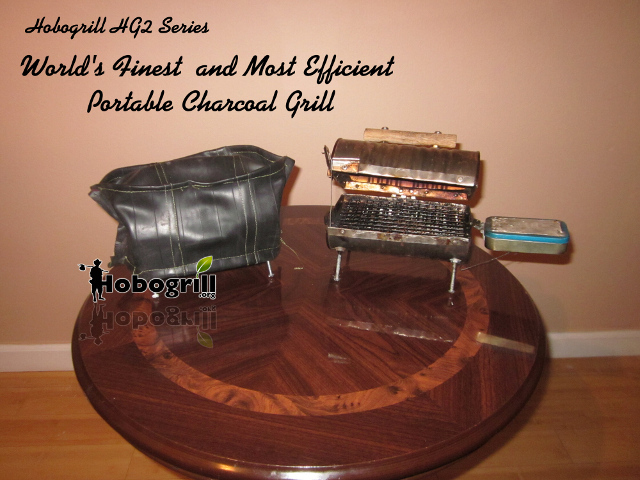 The Hobogrill® HG2 series is the world's smallest, and most efficient, practical portable grill. 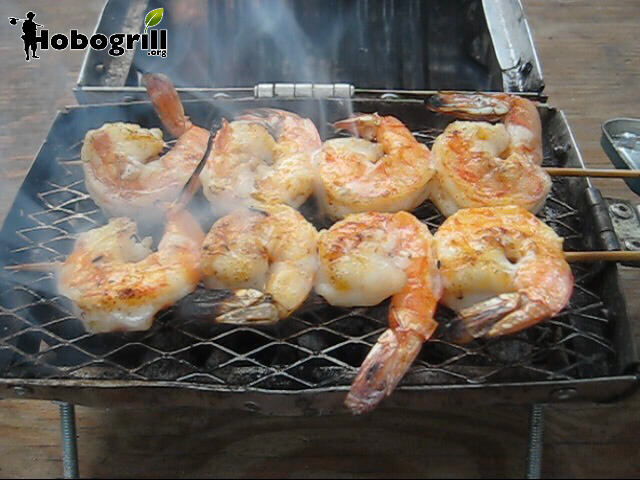 Hobogrill® grills are made almost entirely of recycled materials that are readily found or that which can be purchased easily. 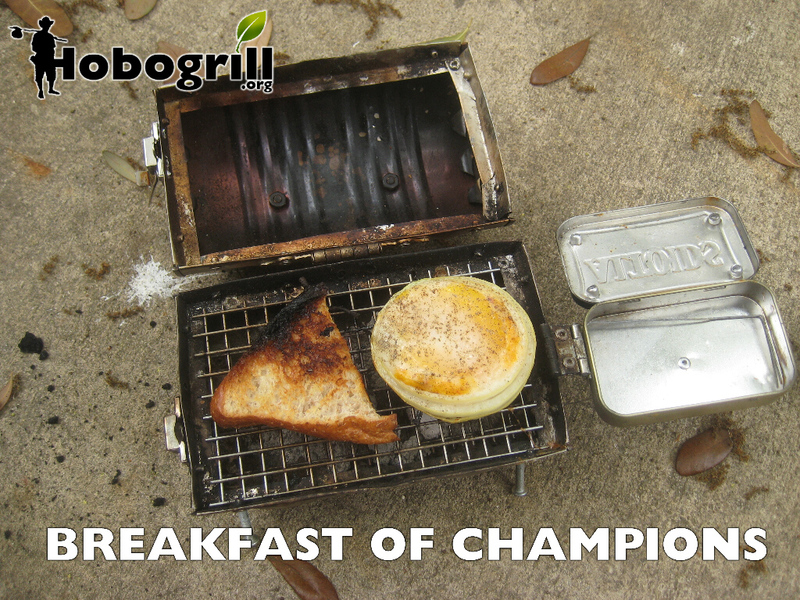 One can cook up to 6 sausages (3 per each side of the grill) on the Hobogrill® HG2 Series. Experience freedom from 'the man' with your own highly effecient cooking apparatus. For the finest in well-designed, hand-crafted, improvised campstoves, have a look at the Hobogrill® HG2-FSC signature series grill. Each fully self contained unit is fully functional and handmade by Hobogrill® founder himself, Neel K. Sanghi, member Sanghi Labs LLC. It's finely engineered to within 3/64" tolerances as to fit all the utensils, charcoal, lighter fluid and fully loaded messkit complete with eating utensils inside the unit. It's even designed to minimize cross contimation by ensuring that none of the cooking surfaces ever have to touch the ground if proper protocol is followed. 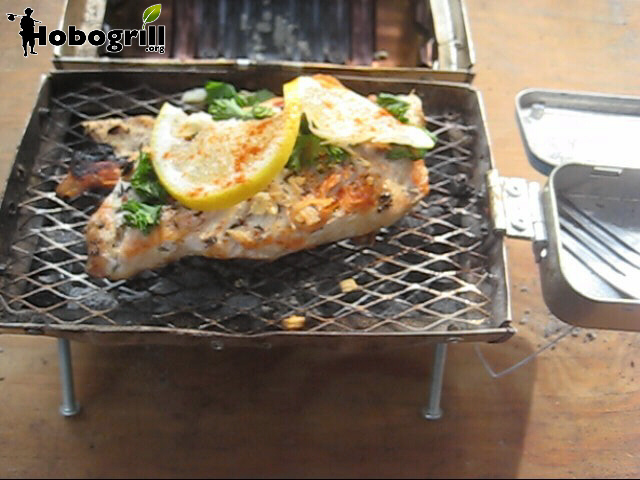 The Hobogrill® folding fork and spoon are kept sanitary between uses in the messtin which also does not ever have to touch the ground due to the brilliant design. It is functional art. 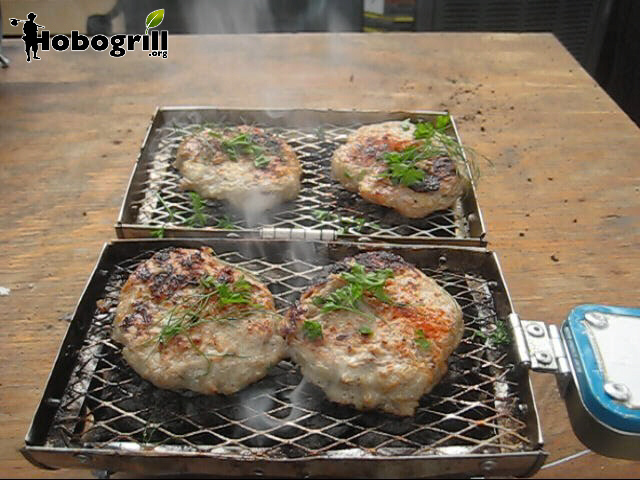 The more you use your Hobogrill® grill the more seasoned, full of character, and beautiful it becomes! Hobogrill® Deluxe class of grills is the only portable campstove on the market that features a built-in sanitary messkit in which the untensils are all metal and collapsable to store inside the messtin. The enclosure is designed for repeated reuse. There is plenty of room left over for matches, fishing line/lure/hooks, some spices or a small bottle of hot sauce, ketchup, condoms, medicine, instant coffee, mints, garlic or shallot cloves, etc. 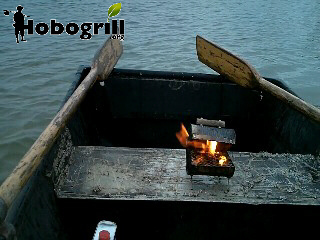 Hobogrill® is a brand of grills and grill accessories made from upcycled materials. It is a Federally registered trademark of Sanghi Labs LLC, All Rights Reserved. Among the Hobogrill® product line is a collection of small portable cooking apparatuses such as one that might be used by a hobo. Now you too can enjoy the same luxuries that hobos have been having which is a hot meal, anytime, anyplace. 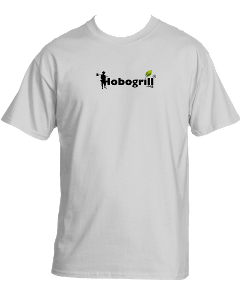 All of the Hobogrill® grills seen on this site are designed, built and tested by the founder himself, Neel K. Sanghi. Design criteria were as follows: lightweight, durable, repairable, practical, self-contained, and good performance and should be manufacturable using readily found/easily procurable and potentially recycled materials. A Hobogrill® grill would be incomplete with out charcoal, lighter fluid and a match. 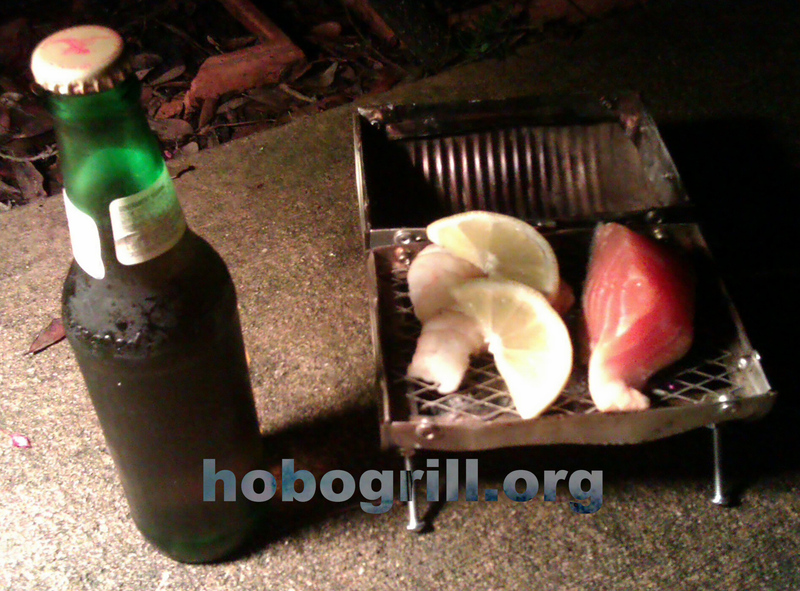 Only use Hobogrill® approved lighter fluid tin with fine nozzle lighting your Hobogrill® grill. So it would be proper to carry these things inside your Hobogrill® brand grill as well. You can easily find a 4oz tin with lighter fluid locally and install a Hobogrill® rubberized cover made from a bicycle innertube. This fits perfectly inside the Hobogrill® HG2 Series grills and stores enough fluid for many lightings of the Hobogrill® grill.